The Audi A8 remains the flagship model from the German car maker across the globe. The first of the lot was introduced in 1994 which replaced its predecessor, the Audi V8. Previous generations of the A8 employed the Volkswagen Group D platform while the current generation A8 is built using the latest D4 platform. 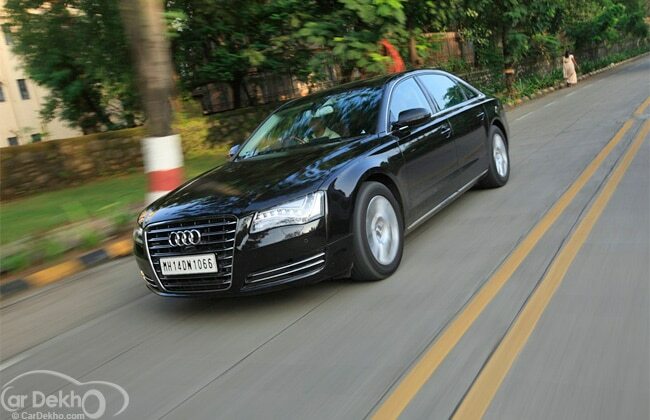 India gets the Long wheelbase version of Audi’s flagship A8 hence the alphabet L after the A8. The latest generation of the luxury vehicle was launched in India last year and we had tested the A8 in its 4.2FSI (Petrol) form to check what it’s capable of. And recently this version of Audi got the powerful and practical Diesel 4.2 TDI version in India fondly known as the mighty V8 (eight cylinder) version. We took the latest Audi A8L 4.2 TDI V8 for a test spin to bring this luxurious road-test exclusively for our readers. The physical appearance and exterior designing on the Audi A8L 4.2 TDI remains the same as its petrol sibling except for the 4.2TDI monogram on the boot which replaces the 4.2FSI monogram as on the petrol A8. The Audi A8L was one of the first cars to use the innovative space frame that Audi terms as ASF. The ASF helps in saving weight and also improves torsion rigidity compared to a conventional steel frame used on other car models and needless to say that by using ASF the Audi A8L 4.2 TDI V8 becomes the lightest all-wheel drive car in the full-size luxury segment combined with best-in-class fuel economy thanks to the weight loss. The Audi A8L 4.2 TDI V8 is a true practical example of aesthetics, performance and technology, all coming together artistically. The Audi A8L 4.2 TDI V8 is Audi’s largest sedan and Audi has left no stone unturned to make the exteriors as beautiful and elegant. The Audi A8L 4.2 TDI V8 is huge when viewed from any angle. Large proportions and size is the order of the day. Dimension wise the new Audi A8L 4.2 TDI V8 stands at 5267mm in length and 1,949mm in width and has an overall height of 1471mm. The front profile of the Audi A8L 4.2 TDI V8 is taken by the uni-frame Audi front French beard grille that has a kind of 3d design look to it giving it a very space age look and making the face of the Audi A8L look a lot appealing. The headlights on the Audi A8L 4.2 TDI V8 get the latest Audi signature LED strip light that look very attractive even when not switched on. The LED strip also has an amber glow that work as turn lights. As mentioned the front of the Audi A8L 4.2 TDI V8 has the family Audi chrome stripped V face that gives it the classy yet muscular look. A set of right vertical chrome strips run across the outlined frame on this grill. The front bumpers are large in dimension going with the overall car design and its proportions. Two vertical chrome garnish strips run vertical on the extreme lower corners of the front bumper. The Audi A8L 4.2 TDI V8 has a coupe like flamboyant roofline that emphasizes Audi’s elegant yet sporty characteristic. The glass area on the Audi A8L 4.2 TDI V8 is large and comes with chrome garnish strips that run around the windows, these strips of chrome help in highlighting the car window lines and look very catchy especially on the metallic black shade Audi A8L 4.2 TDI V8 that we drove. Large side fenders have some sculpted curves and lines on them which flow all along the waistline. The wing mirrors are artistically shaped and fold in an upward angle when the Audi A8L 4.2 TDI V8 is parked. The rear profile of the Audi A8L 4.2 TDI V8 gets the typical Audi treatment with flushed bodyline tail lamps that have the LED treatment on them. The Audi A8L 4.2 TDI V8 has thick chrome strip that runs parallel across the bumper highlighting the breadth of the A8L 4.2 TDI V8. A neat little lip spoiler is integrated into the tailgate. The rear bumper is low slung and houses the twin round chrome exhaust pipes. The Audi A8L 4.2 TDI V8 drives on 18 inches 235/55 Goodyear Efficientgrip tubeless tyres mounted on the 7 spoke luxury alloys. The roof gets a set of sun/moon roof, the front one can be electrically opened while the rear roof can be electrically opened for ventilation. The German carmaker has been using the Audi Space Frame (ASF) been using since 1994. What basically the ASF frame does is that it lowers the overall weight by about 40% and boosts the strength as compared to the conventional frame. The engineers at Ingolstadt have made the new A8L lighter while paying close attention to rigidity and the torsion stiffness which has been increased by 15%. The other major engineering innovations are the hot-shaped steel used for the B-pillar to improve the crash safety and the usage of a special aluminum alloy called ‘fusion alloy’ to reduce flab. Overall build quality on this fully imported car is super high while the fit – finish and paint quality on the A8L puts it in the league of the top of this segment. The looks are huge and it has a lot of road presence, and don’t be surprised if you get a lot of attention when you step out of this magnificent beauty. The Audi A8L 4.2 TDI V8 is as beautiful a car on the outside as it is on the inside. The Audi A8L 4.2 TDI V8 has the best and most luxuriously appointed cabins of not only any Audi but also one of the best in the segment currently. Elegance and Luxury are at their prime and have been implemented on the fullest in here. An array and mix of finest real wood inserts, brushed metal inserts and best hand crafted leather is what the dashboard of the Audi A8L 4.2 TDI V8 made of. The 4 spoke hand stitched leather wrapped steering offers good grip and comes with wood inserts on the top area. The steering is also equipped with all the controls for multimedia and also has paddle shifters. Elegantly laid out Speedo Console also doubles up when the night assist system is in work to display the road ahead. An analogue clock is placed on the centre of the dash. The AC vents are in typical Audi style with chrome inserts around it. Between the centre AC vent is the 7 inch LCD screen that can be stacked inside the dash when not needed at just a press of a button. This screen displays all the various settings, parameters showing all the functions and also doubling up as a reverse camera while parking. The centre console is full of buttons and dials and resembles an aircraft’s cockpit. You have the engine start stop button, the AC control for the front climate control setting, the latest generation Audi multimedia interface (MMI) control stack, a scroll pad that uses the black panel technology where you can input an alphabet to search your phone book and also shift radio stations or music tracks. You have the pop up screen display that is a pleasure to view and if you get distracted you can just slide it back inside the dash at a push of a button. The gear shifter resembles an aircraft’s throttle joystick, the shape and feel is very different to the shifters that we see on any cars normally. Wood inserts is used in abundance all around the centre console and on the gear shifter. Passengers at the rear can also access the music system via the MMI controls that are placed at the rear. The Audi A8L 4.2 TDI V8 is equipped with the latest Bose music system, which comes as a standard; this system is able to deliver about 600 watts from the 14 speakers that are spread across the cabin. The buyer can also opt for the Bang & Olufsen Sound System with 19 speakers utilizing 1400 watts; our test car came fitted with this optional system. This optional system comes with an auto closing tweeter on the dashboard that raises in or out using motorized system when the system is turned On or Off. The audio quality on the Bang & Olufsen System is very powerful and can put a few high end Hi-Fi music systems to shame. The front seats are fully electrically adjustable with 22 settings that include height and lumber settings, heating and cooling. The front seats offer plenty of under thigh and back support plus you can electrically adjust them to suit your perfect posture. You get more comfort at the rear of the cars in this segment and more than 80% of the people who buy cars from this segment are seen mostly on the rear seats. Audi has incorporated the best of the best in terms of comfort for the rear passengers. The seats are super comfortable with electrical adjust on them to heighten the comfort levels. Audi is also offering a special rear seat package on the Audi A8L 4.2 TDI V8 that includes seat ventilation, massage seats and a refrigerator that is neatly stacked inside the back of the centre arm rest. At a press of a button the left rear seat adjusts to the best comfortable position while the front left seat moves ahead increasing the leg room and folds downwards, a power adjustable footrest folds out on which the rear passenger can keep his feet and stretch fully attaining the best comfortable posture easily replicating the first class on a first-class airplane. You can also customize the available feature set to suit you better according to the desired comfort level or height. The centre console on the rear between the 2 seats is again styled like an aircraft’s cockpit with the climate control buttons, electric seat setting and the MMI control dials. You also get a neat foldable little desk that you can place your iPad etc on. There are loads of cubby holes and charging point as well as electric output points are all spread out all around the very well-appointed cabin. Reading lights, cabin lights etc are all in white LEDs and offer a very relaxing glow in the cabin. The boot of the Audi A8L 4.2 TDI V8 has a total volume of 510-litre and can store your entire luggage for the long trips. The boot on the Audi A8L 4.2 TDI V8 can be electrically opened and closed at a press of a button. Leg room head room and loads of space all around the Audi A8L 4.2 TDI V8 is needless to say looking at the sheer size and the wheelbase of this Luxury sedan. The fit finish on the materials used to build the cabin of the Audi A8L 4.2 TDI V8 is exemplary and belong to the highest standards of craftsmanship. There is also the addition of self-closing motorised doors that add to the luxury value of the Audi A8L 4.2 TDI V8. In short, when you step inside the luxurious Audi A8L 4.2 TDI V8 cabin area, it feels nothing short of a well-appointed living room. The Audi A8L 4.2 TDI V8 is powered by a 4134cc V8 engine that holds a mammoth 350bhp of brutal power at tap at 4000rpm. This V8 engine has 800Nm of torque at as low as 1750rpm. The Audi A8L 4.2 TDI V8 comes with Quattro (All Wheel drive) as standard and it uses the 8-speed tiptronic transmission that comes with DSP and sport program as standard. You need to use the push button to start the engine and you hear a distant grumble of the engine running. The engine noise does not enter the cabin even when you rev the engine hard. A very good job of sound/noise insulation is in place on the Audi A8L 4.2 TDI V8 to keep the engine noise at bay along with the tyre roll noise and the road noise. The ride quality on the Audi A8L 4.2 TDI V8 is very relaxed and super comfortable. The rear seat comfort is much better than a few business class seats on the best of airlines. The steering feedback on the Audi A8L 4.2 TDI V8 is light, well balanced and sharp. Due to the huge proportions of the car you need to slightly correct the steering during tight corners at times. The overall ride quality is nothing short of brilliance. The Audi A8L 4.2 TDI V8 swallows speed breakers and bad roads very smoothly and feels like a hot knife cutting through butter. The power delivery is instant and the huge V8 engine has tons of it available at all speeds. On open roads the Audi A8L 4.2 TDI V8 can be super fun, press the throttle and the car shoots forward with what can only be described as an exhilarating response. The 8-speed automatic transmission shifts harmoniously and the double clutch (DSG) system does not let you know the shifts. Audi A8L 4.2 TDI V8 is a fun car to drive too and never is there a dull moment. Add the quattro AWD to the equation and you get a performance like none other out of this 2.2 tonnes of a car. If this is not enough the Audi A8L TDI can also corner for you and that too in a very sedate manner for a car this big, mind you the Audi A8L 4.2 TDI V8 can go from 0-100km/h in about 5.6 seconds and onwards to a limited top speed of 250kmph. You also get the electronic ride control where you can choose between the Comfort, Dynamic, Auto and Individual pre-set modes. You also get air suspension that can be raised or lowered as per the selected drive mode. The Audi A8L 4.2 TDI V8 is not only a good car to be driven in but also a very responsive and fun to drive car to be driven by the owner himself. The Audi A8L 4.2 TDI V8 is a fun to drive car and it’s got one of the most luxurious and well-appointed interiors in the business currently. Then you have the mighty 4.2liter V8 Diesel engine to play with and a never ending list of equipment and highest quality of comfort level that a car in this segment can offer. The Audi A8L 4.2 TDI V8 competes with the likes of the BMW 7 Series, the Jaguar XJ sport and the Mercedes S Class currently. The Audi A8L 4.2 TDI V8 is priced at Rs. 1.07crore Ex Maharashtra. Can’t figure how to describe the Audi A8L 4.2 TDI V8 exactly… “An enchanting luxury sedan of classic and timeless elegance” is probably the closest that we can get to describing it aptly. This car is easily a perfect statement for prestige and accomplishment for someone who has made it big and does not have the word “average” in their dictionaries. Here is one for Audi A8L 4.2 TDI V8, the enchantingly seductive luxurious vehicles from the German carmaker with four rings.